Today we look at the cover, kindly provided by Daniel Dwyer and featuring Rogue Trooper, which will be appearing in Zarjaz #25. Many thanks to Daniel for this astounding piece of work. 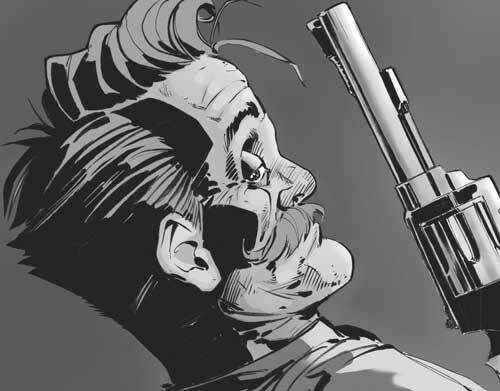 Join us tomorrow as we launch Zarjaz #25! Art By Steve Austin– click to view larger version. Steve Austin (Art: Revolution 1010, Cover) has drawn for various small press publications including Zarjaz, Psychedelic Journal of Time Travel, FutureQuake and the Gaelic language publication Ruaille Buaille and strives to one day draw for the greatest comic in the galaxy, 2000 AD. As this is the cover strip, I can’t resist giving another airing to this little beauty. Art By Steve Austin & Darren Stevens– click to view a larger version. Join us in two days time as we launch the new issues of FutureQuake and something Wicked. JJ Robinson (Writer: The God’s Tear) it’s only your apathy and a few tap’s on Google that keeps us apart…. Shame really, as I’m sure I’d make someone a damn fine wife! Alex Paterson (Art: The God’s Tear) dwells in Salford, has contributed doodles for: Viz, DC Thomson, REX! in Toxic magazine and Hunt Emerson’s Ardnox High. Some readers may have already made the connection, but this strip is a direct sequel to Second Chance, which ran in the pages of FutureQuake #24. 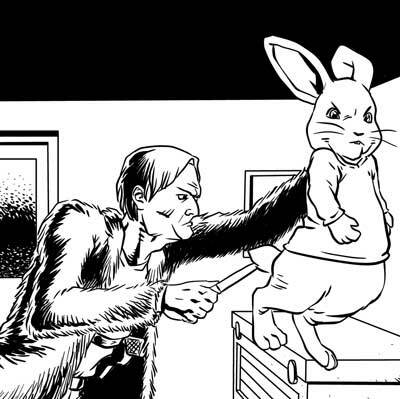 Today we look at The Curious Tale of Hartigan Hare, which will be appearing in Something Wicked #11. This strip features framing pages with art provided by Alex Paterson. This You-tube link provides a brief look at some of the strips featured in that collection. There is also a Kickstarter for the Bomb Scares book, which by the time this post goes live will hopefully be complete. What is the link? You’ll need to get copies of both Something Wicked #11 and Bomb Scares to find out. Jonathan Harris (Writer: Monitors) is a young writer from Seattle trying to make his break into the comic industry, hoping one day to sit among the great writers of the Indie genre. Wes St Clair (Art: Monitors) is a published freelance artist and illustrator. He studied fine art for years at the Visual Art Center of Albert Einstein High School and went on to study at Mongomery College Schol of Art and Design. He finished his education in cartoon and graphic art at The Kubert School in Dover, NJ. Since graduating in 2012, from TKS, he has been published numerous times and is now working as a penciller/inker at IDW and DC comics. Martin Currie (A.B.C. 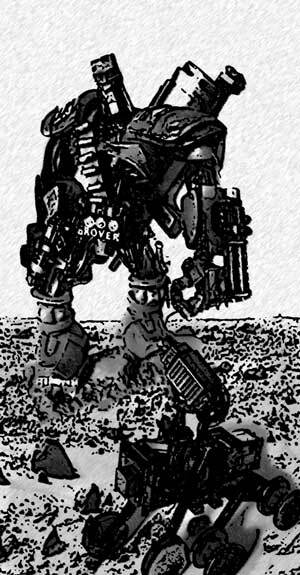 Warriors- Rover) first drew Dredd in 1978, in the margins of his school books. Now in his fifties you’d think he’d have grown out of it. It would seem not.